Overview The polycystic kidney diseases are among the most common life-threatening inherited diseases worldwide and frequently cause kidney failure. Autosomal dominant polycystic kidney disease (ADPKD) is seen predominantly in adults, whereas autosomal recessive polycystic kidney disease (ARPKD) is mainly a disease of childhood. For ADPKD, screening asymptomatic at-risk adults with a family history by ultrasound is considered beneficial enabling earlier treatment of complications and to outweigh the risks. Anatomy The kidneys are retroperitoneal bean shaped organs thats sits between vertebral levels T11-L3. The left kidney sits higher then the right kidney and so the left ureter is longer then the right ureter. The collecting ducts then drain into the Minor calyx → Major calyx → Renal pelvis → Ureter → Urinary bladder. 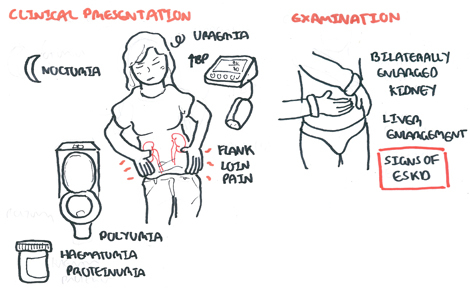 ADPKD is a inherited kidney disease. It is Autosomal dominant and so the risk of developing ADPKD is 50%. However, some 10-15% of patients diagnosed with ADPKD will report no family history. Von Hippel-Lindau disease is a hereditary condition associated with hemangioblastomas, which are blood vessel tumors of the brain, spinal cord. The disease has an increased risk of developing clear cell renal cell carcinoma and renal cysts. ADPKD is a genetic condition. In 80% of cases there is a PKD1 mutation and PKD2 mutation in 20% of cases. This results in a mutation of cells which grow and proliferate forming cysts. These cysts eventually die and fibrose resulting in scarring and fibrosis of the kidney. 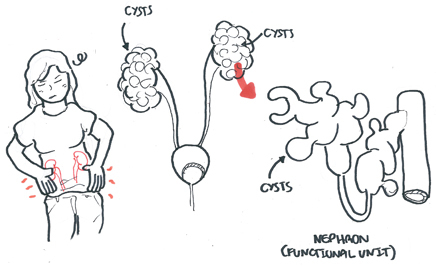 No treatment has been proved to prevent cyst growth or the decline in kidney function. Pharmacology Tolvaptan is a selective vasopressin (ADH) receptor 2 antagonist. It inhibits the reuptake of water from the distal nephron’s and is shown to result in a 50% reduction in the annual rate of kidney growth. Overview ARPKD is primarily a disease of infants and children. The incidence is 1:20,000 births. The kidneys are enlarged, with small cysts, <5 mm, limited to the collecting tubules. ~50% of affected neonates die of pulmonary hypoplasia, the result of oligohydramnios from severe intrauterine kidney disease. One-third will have developed end stage renal disease. 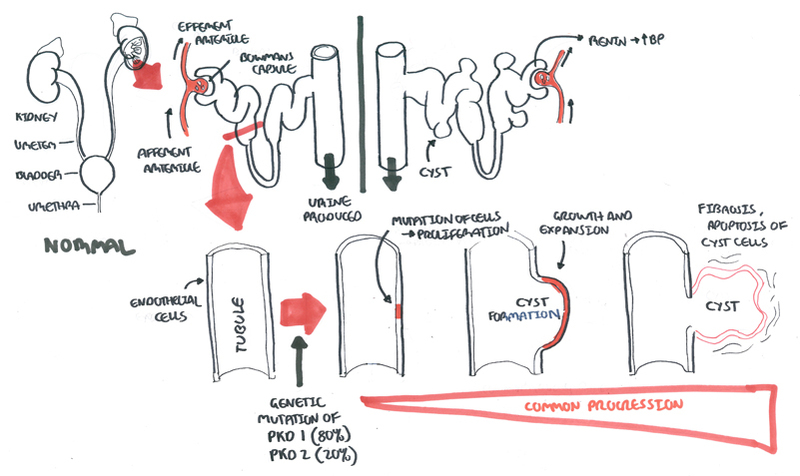 Impaired urinary concentrating ability and metabolic acidosis ensue as tubular function deteriorates. Hypertension often occurs in the first few years of life. Kidney function deteriorates progressively from childhood into early adult life. Longer-term survivors frequently develop complications of portal hypertension from periportal fibrosis. Diagnosis Ultrasonography reveals large, echogenic kidneys. The diagnosis can be made in utero after 24 weeks of gestation in severe cases, but cysts generally become visible only after birth. 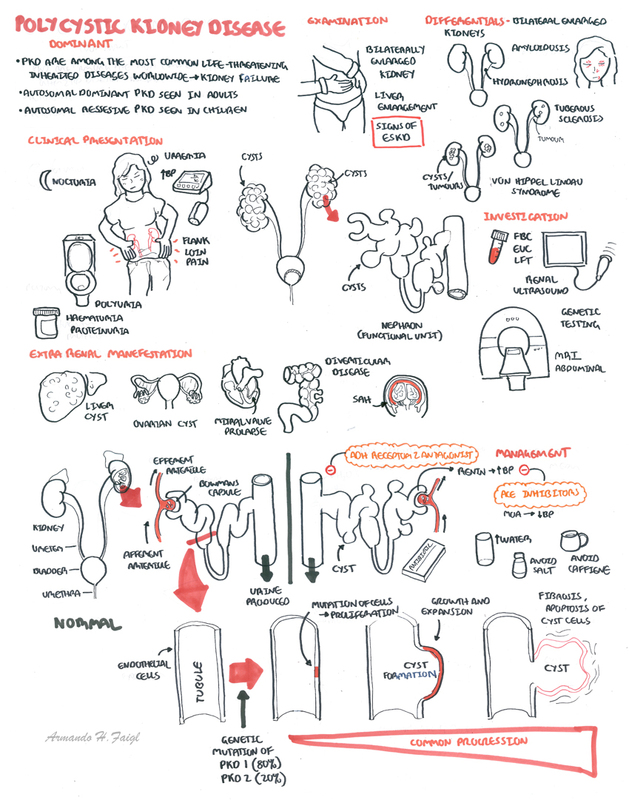 Roslyn, JS 2016,’Autosomal dominant polycystic kidney disease’, The BMJ, vol 352. 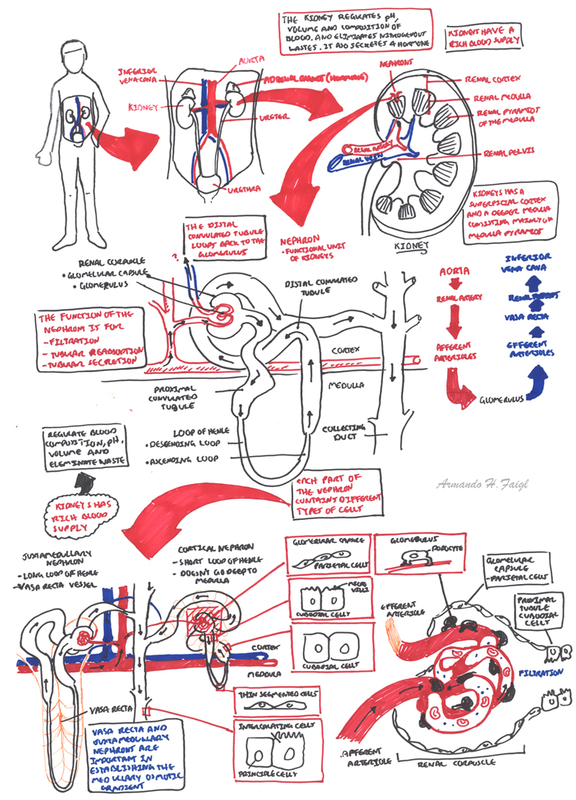 Brenner and Rector’s The Kidney 10th Ed. Harrison’s Nephrology and Acid-Base Disorders 2nd ed.